The Nordic region's most high-profile cruise fleet operator is refitting its ships to make them less polluting, and plans to use a byproduct of rotten fish to help power their new, leaner engines. Norway's Hurtigruten, best known for the ships that ferry tourists along the country's fjords and coastline and up into the Arctic, is investing 7 billion crowns ($826 million) over three years to adapt its 17-strong fleet. "We are talking about an energy source (LBG) from organic waste, which would otherwise have gone up in the air. This is waste material from dead fish, from agriculture and forestry," Hurtigruten CEO Daniel Skjeldam told Reuters in an interview. "Our main aim is to improve and cut emissions," he said. 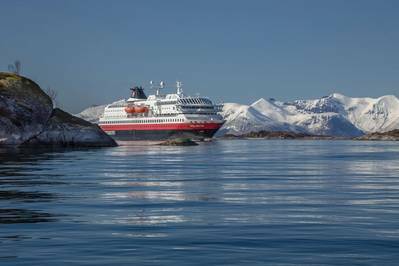 Hurtigruten, also the world's biggest expedition cruise operator to destinations including Antarctica, Svalbard and Greenland, is also ordering three new ships that will run on electricity, with a diesel engine only as back-up. "We definitely have to be there in 2050 as a company and the cruise industry must definitely have to come a long way as well," said Skjeldam. "The changes in the Arctic over the past 20-30 years are not caused by carbon dioxide emissions in the Arctic, but you can see the effects of the emissions elsewhere in the world first in the Arctic," Skjeldam said. "Our crews have seen glaciers retreat and plastic waste on beaches where they land."